Friday night (May 14, 2010), I met the Order of the Arrow National Chief, Brad Lichota (his last name sounds Native American but I haven't asked). 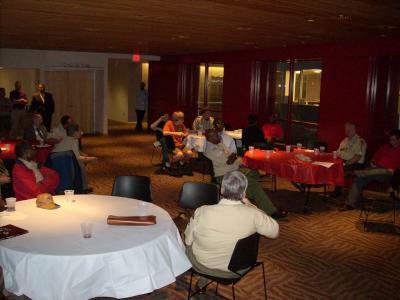 Hosted by Nentico Lodge, and the Baltimore Area Council, a group of adult and youth members of the Boy Scouts gathered at the Reginald F. Lewis Museum in Baltimore City to brainstorm ideas on forwarding the goals and mission of Scouting. It was an impressive group, committed to advancing opportunities to those who are in need. 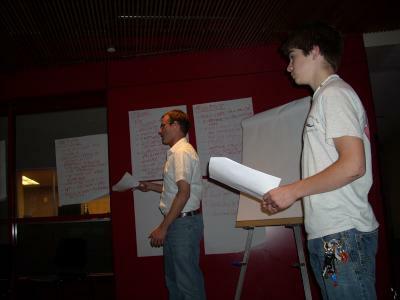 Having a National Chief visit is a rarity, and Brad was a rare young man who quickly absorbed the nature of the challenges, and admitted that his preconceived notions about possible solutions needed to be altered based on what he learned. 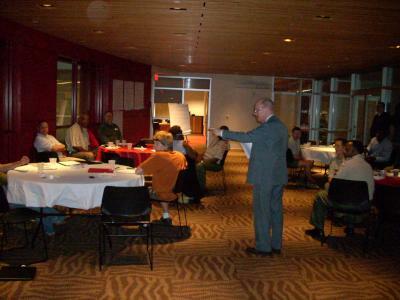 Council Commisioner Charlie Morgan sketching out the objectives of the evening. 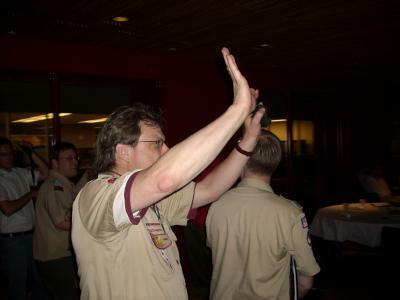 Me, doing a high five/ten for the camera (A. J. Eckstein and Dave Bobart in the background). National OA Chief Brad Lichota on the left, Nentico Lodge Cheif Mike Staskowiak on the right summarizing findings with one of the breakout teams. Continued discussion; yes, the tables are round.